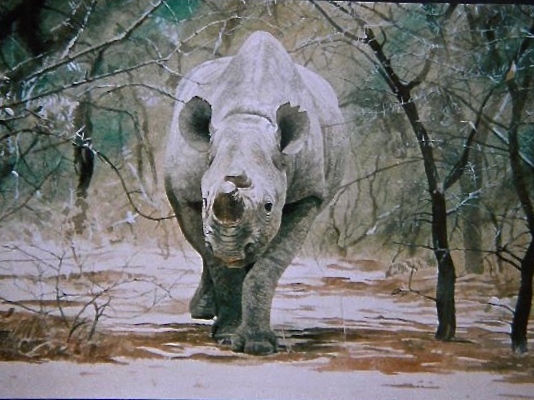 This Black Rhino (or hooked-lipped rhinoceros as is commonly known) was one of a few that was born and lived for a time on my Uncle's farm as part of the Rhino Conservancy in Zimbabwe. One can see the horns have been shorn-in order to dissuade the animal from being shot for its horn by poachers. All of these rhinos were under constant 24 hour guard, and the animals became used to the guard's presence, such that when I visited, I took oranges along with me, which I used as "bait" to attract the animal to come forward in my direction so I could get in close enough to observe and take photographs of it.